You know Dasher and Dancer and Prancer and Vixen, Comet and Cupid and Donner and Blitzen, but do your re-call the most Exciting Super Hero Christmas Stories of all? I never owned this record from Peter Pan records, but I do remember the cover. 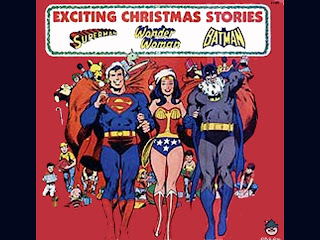 The album produced in 1977 has three separate stories with Christmas adventures for: Superman, Batman, and Wonder Woman. You can listen to each story below. First up, Batman receives an ominous singing telegram on Christmas Eve but dismisses it as the work of a crank. He and Robin go off to a Christmas party at the South Side Mission down town, but soon learn the telegram was no prank when attempts on his life are made by Rudolph The Red Nose Hitman, and then Maxie the Minstrel and Sammy The South Side Santa. Next, The annual tree lighting ceremony on the White House lawn is about to begin. As the president speaks of peace on earth and good will toward men, he and all around him are unaware that a vengeful, deranged scientist has secretly connected the button that turns the light on the tree to the button that launches missiles that can start World War III. Only Superman can prevent the greatest tragedy of all time. Finally, As the world prepares to celebrate Christmas, a powerful nuclear submarine sails under the polar ice-cap to the North Pole. A laser drill cuts a hole up thru the ice, thru which Von Richter, as captain of the sub, enters the village above and kidnaps Santa Claus, taking him to Christmas Island, a barren atoll in the mid-Pacific. Only Wonder Woman can rescue him. Merry Christmas from The Batcave Toy Room. Hope everybody got what they had on the there Christmas list to Santa.